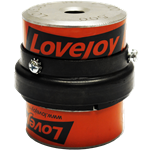 Lovejoy first started manufacturing their signature straight jaw couplings in the late 1920s, and, today (more than 85 years later), Lovejoy continues to sell hundreds of thousands of jaw couplings every year. What makes the jaw coupling so practical and timeless that it continues to be as relevant today as they were during the great depression? 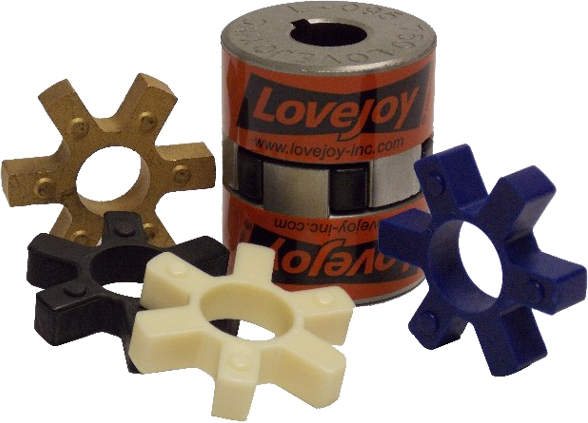 First and foremost, jaw couplings are popular because they are versatile & robust. They truly are and make for an excellent general all-purpose industrial power transmission coupling. They operate in a wide band of temperatures, can handle angular misalignment, can handle reactionary loads due to misalignment, have good torque to outside diameter capability, have good speed capability, good chemical resistance (spider dependent), and decent dampening capability. They are easy and straight forward to install. A basic jaw coupling is comprised of only 3 main parts. Two hubs, and an elastomeric spider or insert. (And, yes, we call them spiders, because, well... they look kind of like spiders... even though our spiders don't always have 8 legs.) For a step by step video tutorial of jaw coupling installation, please feel free to watch this video. Jaw couplings are fail-safe. While, you should periodically check your jaw coupling spiders for wear and replace them (good jaw coupling rubber lasts a very long time, but it does not last forever)... inevitably, someone will forget to check or service a jaw coupling and the spider will wear out or fail. In this case the coupling hubs will interlock and continue carrying the load...though without any dampening capability or other benefits that the spider provided... affording an operator the opportunity to quickly shut down a system. (Note: If this happens, you need to replace both the spider and the two hubs as soon as possible, as the hubs will have worn on each other and no longer be useable.) Hub on hub operation without a spider is extremely sub-optimal, and not recommended for continued system use (unless in the midst of a true emergency situation). Jaw couplings are ubiquitous and low cost relative to other alternatives. Distributors in every corner of the globe stock the product, most likely just a few miles from you. (You can find one here.) Given how common they are, this means not only finding a jaw coupling will be easy... but should also be able to quickly service or replace parts should something unexpected happen. In addition to jaw couplings being considered fail-safe and all the other benefits already discussed above (dampening capability, chemical resistance, etc. 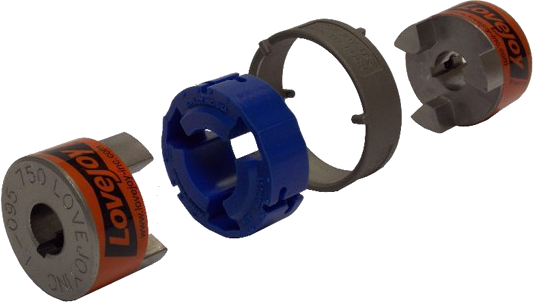 ), jaw couplings are also considered maintenance-free as they require no lubrication. 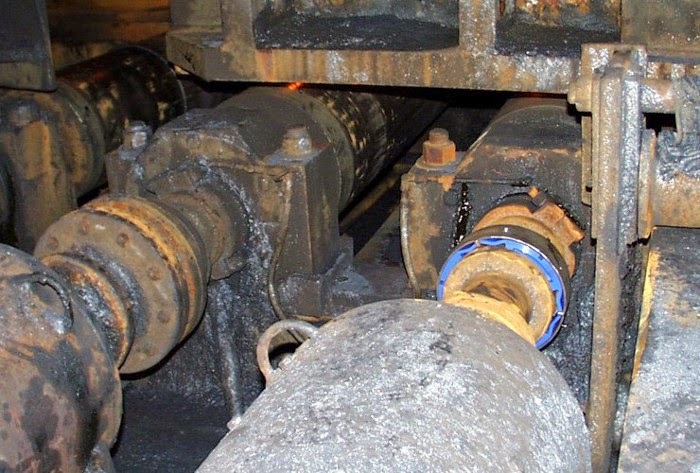 Unlike gear, grid, or chain couplings that require periodic reapplication of grease... as long as the spider remains intact, a jaw coupling will continue to work without additional maintenance required. 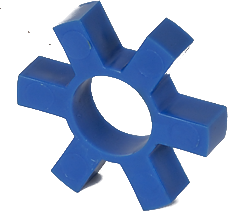 Jaw couplings, in their traditional form, transmit their torque through the elastomeric flexing element in compression (meaning the spider legs get squished). From an elastomeric element perspective, this is preferable for torque transmission because elastomers can generally take much more punishment and load (inclusive of handling peak loads) in compression (squeezing) than the alternative... which is in-shear (getting pulled or stretched). Given the jaw coupling has been accepted as the bread and butter of industrial couplings, spreading far and wide, a final benefit of the design is that there are now a tremendous number of specialty jaw coupling variations for just about every industry you can imagine... providing tremendous design flexibility for equipment designers and maintenance engineers alike. Standard jaw couplings comprise of two hubs (one hub pictured at left), and an elastomeric spider. The hubs generally are bored to a clearance fit tolerance, with a single keyway and set screw, to enable quick installation. Larger standard jaw hubs (above L190) are traditionally manufactured out of cast iron, which is also a proven mature technology, as this technology is more cost effective for the given sizes and quantities seen in this product range. Stepping just outside the standard, aluminum hubs (either cast or from bar stock) as well as stainless steel (from powder metal, cast, or bar stock) are also very popular. Aluminum is particularly popular because it is light and does not rust, while stainless steel is popular in food and pharmaceutical environments. The most standard fundamental jaw coupling spider is a spider constructed of solid Nitrile Butadiene (Buna N) rubber (pictured at left). This flexible elastomer is oil resistant, resembles natural rubber in resilience and elasticity, and operates effectively in a temperature range of -40° to 212° F (-40° to 100° C). This rubber is well suited for cyclic loads (stop/start or reversing). Broadly speaking, this spider generally has a shore hardness of 80A, high dampening capacity, and good chemical resistance. Another popular variation of the Nitrile Butadiene (Buna N) rubber spider is the open center option (pictured right). 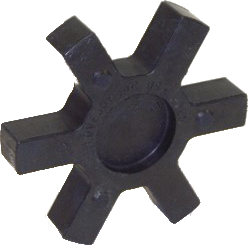 While the closed center version (pictured above) is a more robust design, and more desirable particularly for higher speed applications, the closed center does not allow for extremely close (near touching) shaft separation. Simply put, the open center spider is designed primarily for applications where the between shaft ends (BSE) distance is very tight, and there is no room for center section (though it will certainly also work for application where the BSE could accommodate a solid center spider). A third variation is for the spider to wrap around the outside of the coupling, and then be held in place with a retaining ring. There are several ways for this concept to occur (one of which is pictured at left), with the primary advantage of this approach being that it allows for easy spider replacement (as the coupling hubs do not need to be slid back or moved on the shaft). The primary disadvantage of this variation is that it is typically restricted to lower RPM speeds only, sometimes as low as 1750 RPM based on design. (The LC design, shown at left, has a 3600 RPM max.) The other disadvantage of this design is cost (given it is a more complex design). Pictured at the top of this article (and also at right) are individual elastomeric cushions. In the really large jaw couplings (C and H type), these cushions are used in place of one piece elastomers, but behave very similarly. They are held in place with a collar and hardware kit (securing the collar to one of the two hubs. 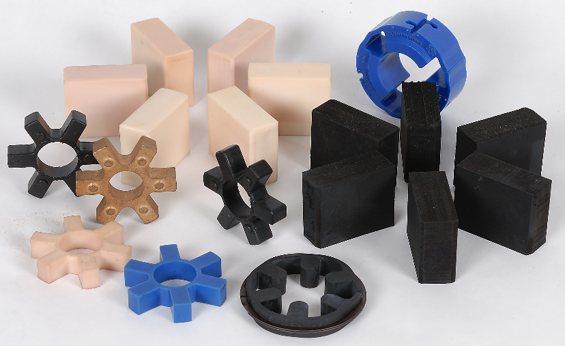 In addition to the standard Nitrile Butadiene (Buna N) spiders, urethane (pictured left), Hytrel®, and Bronze are also popular materials. 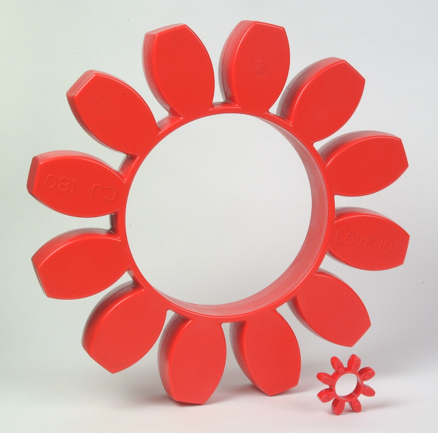 Urethane has a greater torque capability relative to Buna N (approximately 1.5 times), but provides less dampening effect. Its operational temperature range is also reduced on both ends of the spectrum (-30° to 160° F, -34° to 71 C). It does have good resistance to oil and chemicals, but is not recommended for cyclic or start/stop applications. Hytrel® spiders (pictured right) is designed for high torque and high temperature operations (-60° to 250° F, -51° to 121 C) and has excellent resistance to oil and chemicals. It is not recommended for cyclic or start/stop applications, and is also generally limited to a half degree of angular misalignment (vs generally 1 degree for Buna N and Urethane). Parallel misalignment handling ability does remain similar to Buna N & Urethane spiders at approximately 0.015 inches. 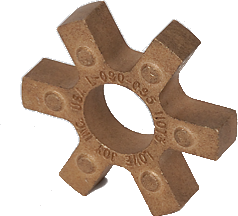 Bronze spiders are rigid, porous oil-impregnated metal inserts that are designed exclusively for slow speed applications (max 250 RPM) that require high torque capabilities. These spiders are largely not affected by extreme temperatures (-40° to 450° F, -40° to 232 C), water, oil, or dirt. Angular misalignment capability is similar to Hytrel® (generally at a half degree), but parallel misalignment handling is reduced to 0.010 inches. 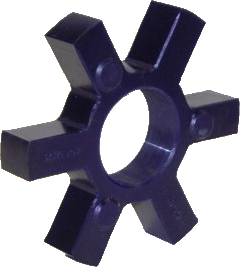 Traditional jaw couplings are limited in operating temperature to what can be handled by the elastomeric spider (as cited above). These couplings do offer moderate misalignment handling capabilities (both in angular and parallel), but some applications may require more. Radial stiffness may introduce high reactionary loads in these couplings, and vertical applications may require special hubs (if setscrew proves insufficient in keeping hubs from sliding). Lastly, traditional jaw couplings are no well suited for motion control applications because they do have backlash (there is some looseness between the jaws and elastomer... which will become more compressed over time). One additional jaw coupling variation not discussed above is the jaw in-shear. This design allows a traditional jaw (with elastomer in compression) to quickly be turned into an elastomer in-shear, which is a non-fail safe design. In addition to being non-fail safe, this design is also very easy/quick to inspect or change out. 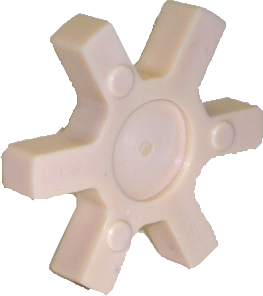 Should/when the elastomer needs to be replaced, simply rotate and slide the shaft collar off, unwrap the old spider, put a new one on, slide the cover back on, and twist. The design shown is completely interchangeable with standard jaw coupling hubs, so "upgrading" to this style on requires purchasing a new spider kit (the wrap around spider and ring). 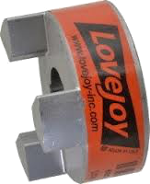 Should you have any further questions on jaw couplings, please do not hesitate to contact us by phone and/or by asking us a question at the link on the top of this page.